Trent Schara of Atomic Customs in New Mexico is a guy that’s been building bikes for years. You might remember the “Fish” bike, the “Mexipan”, or more recently the “Frost Lord”. All these bikes, especially when he showed up to BF3 with the Frost Lord, led us to ask Trent to be one of our invited builders. Last year he did a great black and blue shovel and this year he is putting together a crazy pan-shovel. He just picked up the OG wishbone frame and tins from his painter JP Rodman and is already on final assembly! 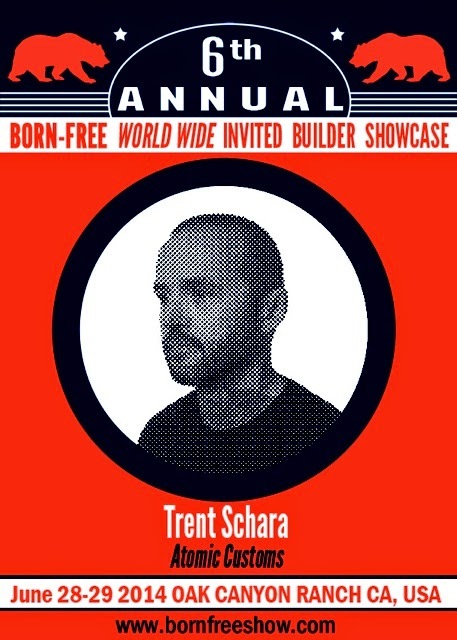 Trent’s bikes are built to ride (he’s done the EDR many times) and you can bet this one will be too and that’s great because you could pick Trent’s bike if your lucky ticket gets pulled this year at Born-Free 6 either Saturday or Sunday! you’ll have your choice of a dozen Invited Builder bikes of all types, styles, motors, etc, but you must be present to win! Get your BF6 poster with free ticket to enter the giveaway from Lowbrow Customs by clicking HERE. Remember if you buy two or more in one transaction you are entered to also win a rebuilt ’52 Panhead engine March 22!!! Follow Trent’s blog HERE and on Instagram HERE. This entry was posted in Uncategorized and tagged atomic custom, bf6, Born free 6 invited builder, Born free show, Harley Davidson, panshovel, trent schara, win this bike. Want to Win A Custom Bike/Bikes at Born-Free ? Did you say free BBQ?? ?